An elderly lady presented to the emergency department following a fall. Apart from a few minor scrapes she came through the ordeal relatively unscathed. However, examination of her ocular movements demonstrated an abnormal finding. Q1. Describe the clinical finding. When the patient was asked to look right, there was voluntary conjugate deviation of the eyes to the right. However, when she was asked to look to the left, the left eye abducted but the right eye failed to adduct — it did not move past the midline. 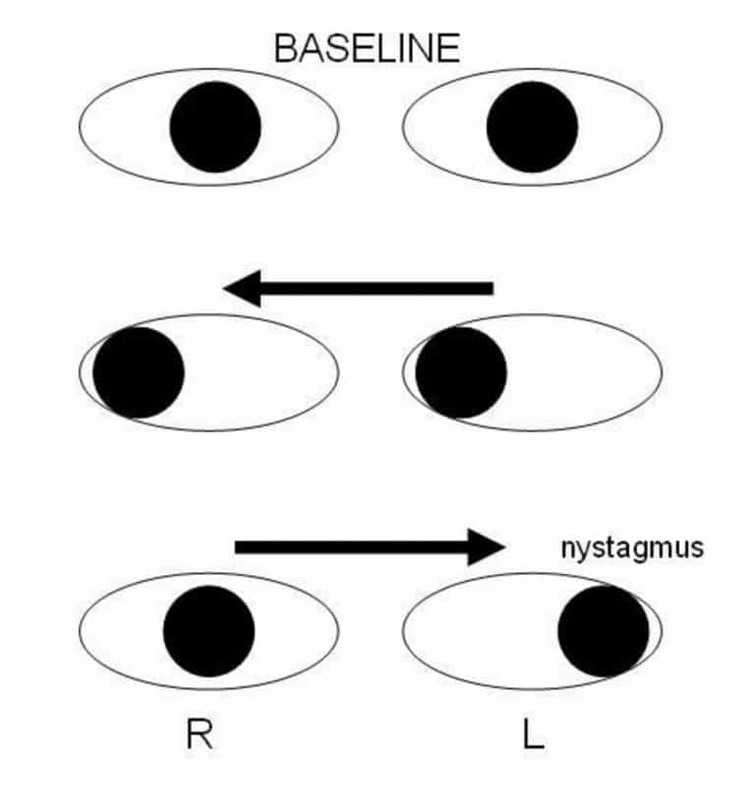 In addition, although not shown in these images, horizontal nystagmus was noted in the left eye when the the patient was asked to look to her left. Q2. What is the name of this clinical finding? Unilateral internuclear ophthalmoplegia (INO) affecting the right eye. In INO, when the patient’s gaze is directed away from the side of the lesion, the ipsilateral (adducting) eye will not adduct and the contralateral (abducting) eye demonstrates horizontal nystagmus. Surprisingly, pateints with INO do not usually complain of diplopia! Q3. Where is the anatomical lesion? Internuclear ophthalmoplegia (INO) is caused by a lesion in the medial longitudinal fasciculus (MLF). Volitional saccadic pathway with a lesion in the right medial longitudinal fasciculus (MLF) that results in an internuclear ophthalmoparesis (INO) during an attempted saccade to the patient’s left (from neurology.org). 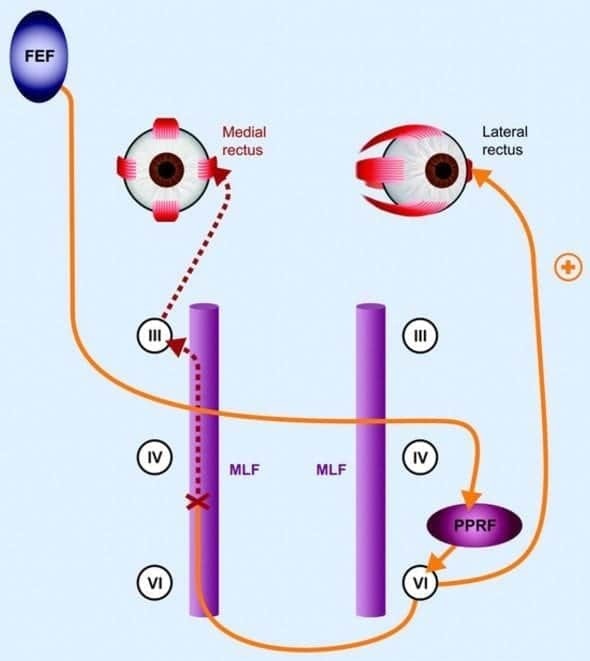 The MLF provides a connection between CN3 nucleus in the midbrain (and, therefore, the medial rectus) and the CN6 nucleus in the pons (abducens) on the opposite side and facilitates conjugate eye movements on lateral gaze. Abduction in either eye is normal, whereas adduction is impaired, resulting in dissociation of eye movements — in other words the eyes move independently on lateral gaze. When each eye is tested independently by covering the other eye, medial rectus function is shown to still be present. Saccades may be slow before adduction is impaired. In this case, the lesion is affecting the MLF between the left CN6 nucleus and the right CN3 nucleus. Q4. What are the possible causes of this clinical finding? likely cause in adulthood/middle age; often bilateral. 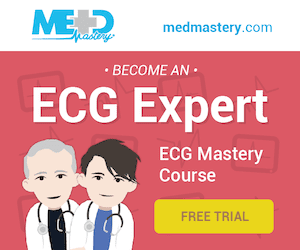 likely cause in the elderly or people with vascular risk factors; often unilateral. more likely cause in children. Bilateral INO is nearly pathognomonic for multiple sclerosis. Q5. What is a one-and-a-half syndrome? The ‘one-and-a-half’ syndrome is an internuclear ophthalmoplegia combined with a conjugate gaze paralysis in the other direction. One eye fails to adduct on attempted lateral gaze (‘the half’) and the other eye neither adducts nor abducts (‘the one’). The eye that can abduct may exhibit horizontal nystagmus when it does so. The responsible lesion is an extensive paramedian pontine lesion that involves the MLF and either the CN6 nucleus or the PPRF (parapontine reticular formation). If the INO affects the left eye, the lesion is on the right (same side as the eye with the complete conjugate gaze palsy). The PPRF is the brainstem gaze center that controls horizontal gaze. 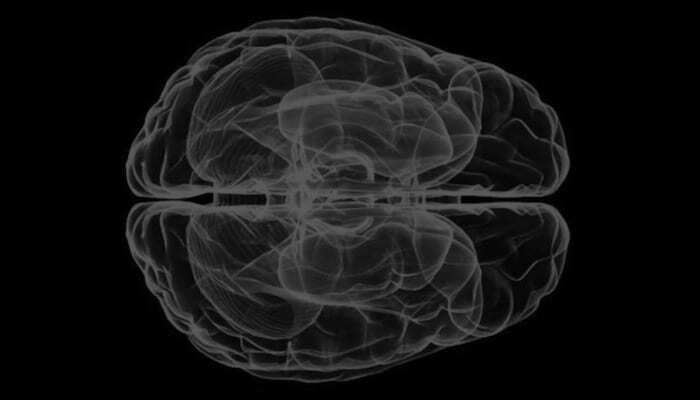 It innerves the CN6 nucleus and receives projections from higher centers including the contralateral frontal eye fields. An ipsilateral gaze palsy results from a lesion in either the PPRF or the CN6 nucleus. One-and-a-half syndrome usually occurs in conjunction with other brainstem symptoms and signs. most common cause in the elderly. most common cause in young adults. Duong DK, Leo MM, Mitchell EL. Neuro-ophthalmology. Emerg Med Clin North Am. 2008 Feb;26(1):137-80, vii. PMID: 18249261.